Well, I finally got my 4.77's and Aussie Lockers installed. Drove it home from the dealer yesterday, and wow, what a difference. Have to really change the driving style and be careful when going around corners. I can imagine that it will be really helpful offroad, but if I drove this onroad more I would probably not want the rear locker to be an auto locker. Considering I have only driving 1500 miles in the last year, it shouldn'e be much of an issue. On another note. I did not notice as much of an acceleration increase with the new gears as I was expecting. The VX is now more capable then I will probably ever push it. Sound (clicking noise) loud ? Rear end wants to break loose in low traction situations ? yeah, clicking is loud, though someone suggested using a heavier weight oil to help a little, but there is a audible click when turning more then half a rotation on the steering wheel. I haven't had it in low traction situations yet, but while turning on dry pavement with the front hubs unlocked it would go straight if you accelerated. I would think with a wet surface it would really want to break free with the MT tires on it due to the lack of gripping edges. Remeber, I only have 30 miles on it so far. First impressions. We are going offroad on the 8th and that is an hour away, so I should get some good feedback then. Thank You...I'm looking forward to more info after your trip. Saturday, 100 miles of diriving, engine running for 10 hours, and 11 mpg. Not too bad I thought, but it was a half tank almost. We had three VX's running, a good comparison of modification levels. PittVX was running stock everything except aggressive 265 AT tires. JollyRogerVX was running a 2 inch lift, 265 MT tires and rock sliders. I was running, 3 inch lift, 285 MT tires, rock sliders and lower gears and 2 lockers. I was obviously the most capable of the three, and I do think it showed. I could do a number of obstacles in a lot less time and a harder line than the others. The ride was great because they setup the day so everyone could do everything, with just a couple side obstacles with easier bypasses. You could easily tell the advantage of having the front locker. In a number of spots I was easily able to pull myself up and over the ledges or rocks with a lot less gas and a lot more control then they were with their open front diffs. Took a little getting used to though because there are a couple pics in a couple spots of my driving around on three wheels, but still with plenty of traction. They said one was 18 inches of the ground at one point. HEHE heavy footed. 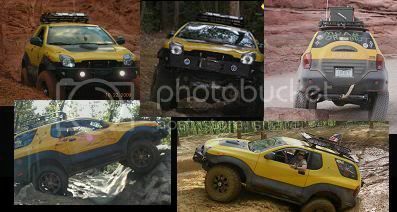 I have to say overall the lockers were a great investment for increasing the abilities of the VX offroad. It gave me a lot more control over traction so I could use a lot less gas and a lot more finesse, not to say I still didn't need to get the foot in it to get up over the ledges, I could just restart next to the rocks, rather then haveing to roll back a couple inches to get a run at it. Though, once I did have the wheels locked to the right to get out of some ruts and when I hit the gas I went straight as the locker locked and I could not turn. I just revered it and away I went. Just gotta be careful. Well, I know my next mod, the bumper will be done by the end of next week. Then I have a few maintenance items to complete, track down all the wire harnesses under the body and clean and grease em. I am going to try swapping wheels and tires off my expy too. They are the same diameter, just about 2" wider and a better tire, procomp AT Extremes. Should look interesting at least. After that, saving pennies for the locker, probably order 1st week in Oct, and then its on. Gotta pick up hubs sometime before then as well. Thanks for the update, no action pics? pics will be in the Pittsburgh Dirt Days II thread after the wife finds space to download the 4 gigs of pictures. Sounds like I will be doing this mod eventually. First i'm planning on dropping the front diff, don't want to put too much stress on those CVs.